In a rather unnerving start to the novel, Mario’s doubts transmit themselves to the reader, but we soon realise that there’s a lot more to the story than we realise. 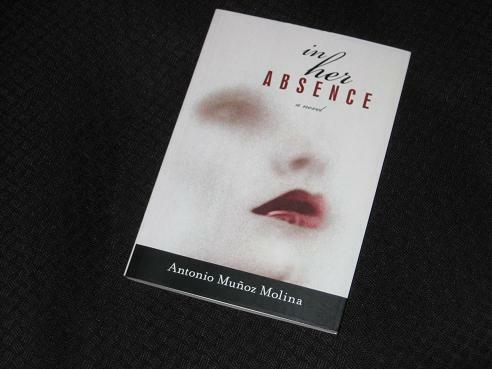 In Her Absence is a great little book, a story I enjoyed immensely, running through it in little over an hour. The writer creates a man who inspires sympathy and unease in equal measure as the reader is treated to his version of a love affair and a marriage which he fears may one day crumble into nothing. In many ways, though, it’s Blanca who is the star of the story, rather surprisingly when you consider that she rarely speaks or appears other than in Mario’s eyes. However, Mario’s intense focus on his wife forces us to look at her closely too, even if the writer rarely gives us enough information to make up our minds on what lies beneath the beautiful exterior. Mario may have won the hand of the fair Blanca, but his insecurities will always have him suspecting that the happiness he feels is temporary and that one day his wife may simply drift away. I decided to read In Her Absence having recently tried Muñoz Molina’s epic novel In the Night of Time, and while the style is similar in parts, these are two very different books. In the Night of Time is a slow-burner, using its 650+ pages to full effect, each page slowly adding a further detail to the picture being painstakingly drawn (on a *very* big canvas…). In Her Absence, though, moves much more quickly and is also, necessarily, a much more intimate piece of writing, with Mario’s first-person monologue drawing us into the story in a way that only occasionally happens in the longer work. One of the most interesting features of the book is the way in which we come full circle, with the opening scenes continuing on the final pages. Mario is left with the woman he sees as being like Blanca, but not her, and part of the puzzle of the book is working out what this actually means. Has Blanca betrayed him? Has he finally given up on loving her? Or has the woman he loved for so many years turned out to be just a figment of his imagination? Interesting review… Feels like there us a menacing undertone which I normally love.